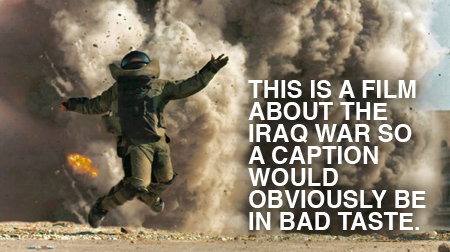 A lot of people have written a lot of positive things about The Hurt Locker. The Awards Circuit are predicting it as a contender for the Best Picture Oscar. It made $36,000 per screen when it had its limited release in the States. It has a 98% (that’s 98%) score on Rotten Tomatoes. Which is all fair enough because it is jolly good. However, it does sag a bit in the middle and there’s something faintly forgettable about the whole thing. But you can’t win them all. TOP TIP: Even though the cast is mainly C-list, there are two B-list stars and one A-list star in it, all of whom you won’t see in the trailer. Will this be enough to make you see the movie at the cinema or will you just go on IMDb and read what I’ve chosen not to write here? The choice, as they say, is yours.